Once again we stroll (or likely stumble) into another Tuesday as time ticks ever nearer towards the close of summer. Sad as it may be, fall has it’s own delicious festivities (+ fashions) in store. But while summer’s still here, let’s savor the season in all it’s glory. And I mean so quite literally, as it’s Tuesday again and the drinks are being served in all their decadence. 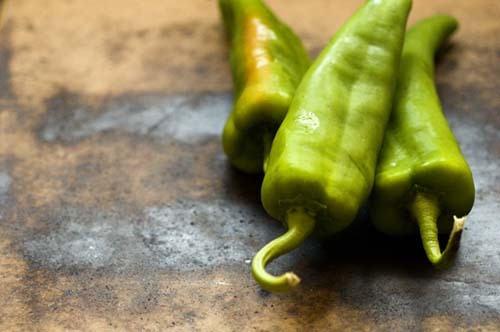 Hatch chile refers to varieties of species of the genus Capsicum which are grown in the Hatch Valley, an area stretching north and south along the Rio Grande from Arrey, New Mexico, in the north to Tonuco Mountain to the south of Hatch, New Mexico. The soil and growing conditions in the Hatch Valley create a unique terrory which contributes to the flavor of chile grown there. Though only chile grown in this Valley is considered “Hatch”, the chile growing industry is extremely important to the economy of New Mexico as a wholeNot only is the industry important economically, it is also a prominent part of New Mexican culture. It is the official state vegetable (though it is actually a fruit till harvest) and the official state question is “Red or Green?”. So, with Hatch season in full bloom, here’s a cocktail muy caliente to honor the verdant vegetable. Images via homesicktexan, spicysouthernkitchen. Info via wikipedia. Recipe adapted from spicysouthernkitchen. Posted in DIY, FOOD, INSPIRATION. Sulfur is really an important vitamin employed for many functions within your body.